Here at CES, Jabra has introduced a music phone speaker dock. The company is more famed for its Bluetooth headsets, but has decided to branch out. 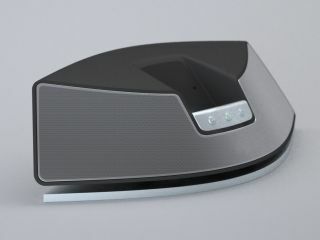 The speaker can also be plugged into music players, laptops or desktops. It can also be connected to more than one device at once. Jabra tasked Klipsch Audio Technologies to produce the speaker and says the dock "delivers bass, detail and clarity not available in other speaker systems for mobile phones." The dock is corded, though we wouldn't be surprised if a Bluetooth model appeared soon. The reason for bringing the device to market is clear: "Forecasts show the number of mobile phones with music-playing capability will reach 700 million units by 2008," according to Jabra's David Wood.